Eye tracking is a luxury not everyone needs, but when it works, it works. Tobii’s latest eye-tracking peripheral, the Eye Tracker 4C, refocuses itself on gaming while cutting out some of the cruft that limited its predecessor. Its basic constraints, however, haven’t measurably changed. Eye tracking sounds magical: The small, USB-powered 4C “eye mouse” sensor mounts to your monitor, watches your eyes, and “teleports” your cursor to where you’re looking. Available for $149 via the Tobii Web site (with a mandatory $25 shipping fee) the 4C is priced at $10 more than its predecessor, the EyeX. The 4C began shipping on December 2. It’s a hefty price for a peripheral that essentially supplements your mouse for work and play, though Tobii continues to add features to justify the price tag. While the EyeX added facial login via Windows Hello, a feature that carries over into the 4C, one of its flagship innovations is a new “head tracking” feature, though currently available in just a single game. Tobii’s 4C also now offloads all of its requisite computing power into a dedicated EyeChip ASIC housed within the 4C itself. Both the EyeX and 4C only work with a single monitor, however, and neither offers the absolute precision you might hope for. Although you can mount the 4C to a notebook, it’s probably best to attach it to a desktop monitor. Be sure you’re committed to the 4C before you install it. 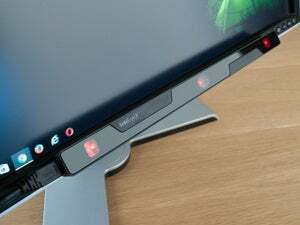 Like the EyeX, the sensor bar magnetically attaches to a small, flat mount that essentially glues itself to your monitor or screen. (The 13.2 x 0.66 x 0.6-inch thick sensor bar fit neatly within the bezel of my circa-2008 Dell 2408WFP monitor, but you may be out of luck with a more modern, bezel-less monitor.) 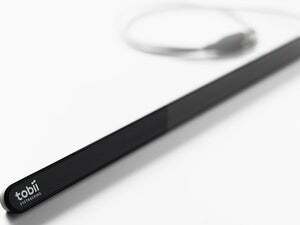 A 31-inch-long USB cord snakes between the sensor bar and your computer. 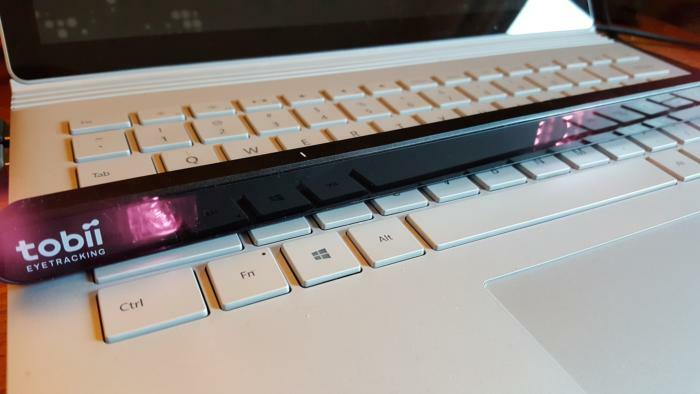 The other improvement the 4C offers is that Tobii has noticeably decreased the luminance of the sensor bar’s integrated LEDs, which track your gaze by flashing 90 times a second. At worst, I had the sense of staring into the embers of a dying fireplace. I actually used the EyeX’s mount to secure the Eye Tracker 4C. It worked fine. Also, don’t even think about buying the 4C if you own a Mac or run Linux, as Tobii’s drivers (contained within a 223MB software download) only support Windows 7, 8.1, and the 64-bit version of Windows 10. Otherwise, dubbing the 4C an “eye mouse” is a pretty accurate term. The software allows you to look at a point on the screen, then “teleport” your cursor to that spot, just by twitching your mouse or touchpad. You can also “teleport and click” by tapping a user-configurable key. As before, the 4C’s accuracy seemingly varies by eye, though I found it slightly better than the EyeX. While browsing, the most effective way of using it (as Tobii has recommended) is to slightly twitch your hand, letting the 4C do the “work” of moving across the screen. You’ll have to check boxes and tweak sliders to make decisions on whether to allow the 4C to teleport only if you twitch your hand in the direction you want it to go, as well as configure the size of the “dead zone” around the cursor beyond which eye tracking is active. It’s really a matter of trial and error, and determining what works best for you. Still, many of the limitations of Tobii’s eyeX remain. The 4C operates on only one monitor at a time. 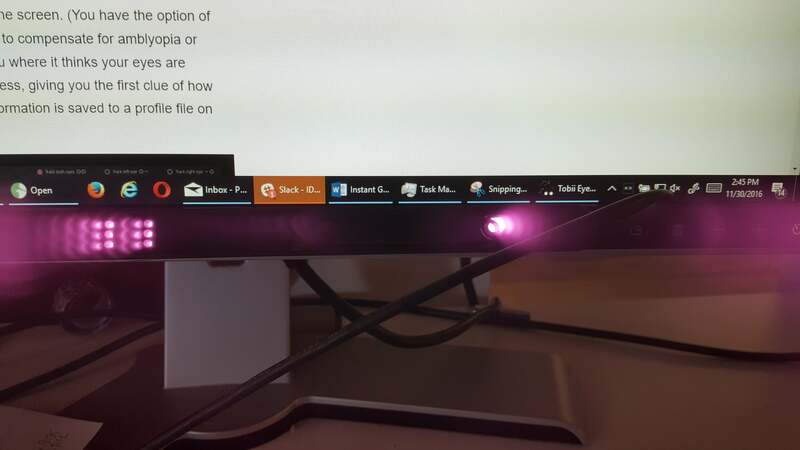 If you have multiple monitors, it won’t teleport the cursor from one to the next—you’ve got to swipe, swipe, swipe, just like the other peons. Although the device can adjust for eyes wearing contact lenses and glasses, its accuracy may be affected by bifocals or very strong prescriptions. Like the EyeX, Tobii has added small white guide marks at the top to help properly align it. Somewhat ironically, the 4C seems to work best in conjunction with a notebook trackpad, as you can leave your fingers on their proper keys while trailing a finger over the trackpad to move the cursor. But beware you don’t absent-mindedly close your notebook on the sensor bar—crunch! 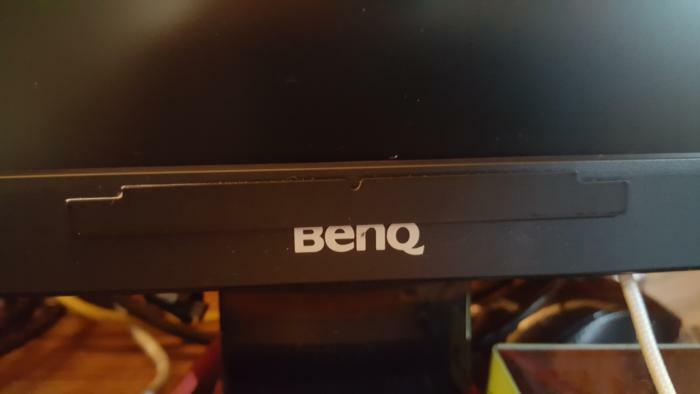 You’re probably better off using it with a desktop monitor, even if you have to take your fingers off your keyboard to move your mouse. Then again, you may be left chewing on the fact that you’ve paid over $150 to save yourself a few swipes. Thankfully, that’s not the only reason to buy the 4C. After hours, the gizmo transforms from a somewhat average productivity aide into a sidekick for gaming. When I previously reviewed the EyeX, I wasn’t especially impressed with the performance as a gaming peripheral. After using it with two modern games, my opinion improved. For gaming, Tobii recommends you download its Infinite Screen Extension, a rather nifty gaming utility that begins to “turn” your player’s perspective as your eyes wander near the edge. Naturally, Tobii’s software works best when specifically supported by a game—the Extension software lists 10 titles with game-specific options. For me, at least, some of the 4C’s options were overkill. Using the same Surface Book I’d used previously, I tested Ubisoft’s just-released Watch Dogs 2, a third-person open-world shooter, as well as the much slower-paced Elite: Dangerous. Both promised that I’d be able to use eye tracking to quickly target enemies onscreen. Elite promised something else, too: a beta form of head tracking. Version 2.5 of Tobii’s software, published this week, specifically adds support for that new feature. Elite: Dangerous has you flying a ship across a virtual galaxy. The game features long stretches of dull, monotonous travel punctuated by frantic ship-to-ship battles. Elite already allows deep configuration options, and Tobii does the same. 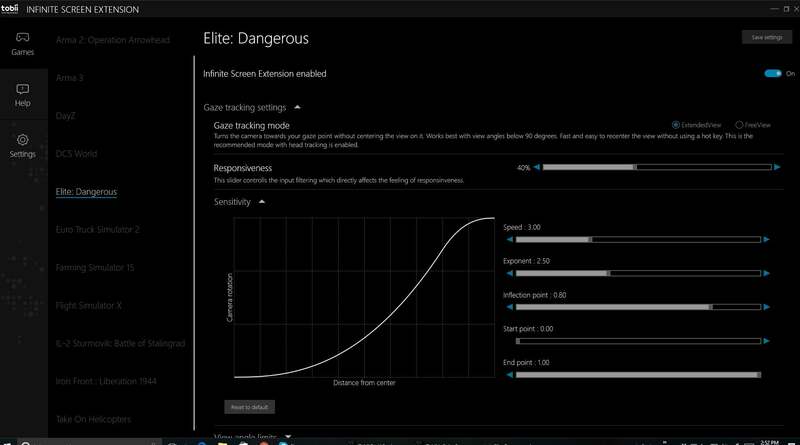 In Elite: Dangerous, you can configure head tracking and eye tracking controls independently. Head tracking focuses on the location of your head and adjusts the onscreen image according to its rotation, in addition to tracking your eyes. This is simpler than it sounds: If you turn your head toward your right shoulder, your gaze is dragged along with it. Just looking left doesn’t necessarily rotate your head, but Tobii’s software gives you the option to configure it that way. As experienced in the game, head tracking allows you to whip your field of view around quite quickly, while eye tracking moves more gradually. Adding Tobii Eye Tracker 4C is somewhat useful. Tracking a bogey with your eyes as it zooms by your cockpit is a natural reaction, and the 4C eye tracker allows you to do so naturally. On the other hand, the software automatically triggered “popup” instrument panels as my gaze slid over them, which became annoying fast. I had better luck with Watch Dogs 2, a much more modern game which the Book struggled to run, generating 20-odd frames per second at low frame rates. Here, Tobii promised explicit support, including “gaze to shoot” options that would fire my character’s gun at the target I was looking at. Most of the other gaze options worked fine. My character was able to zip from cover point to cover point as I looked, and interact with whatever objects my gaze landed on. From this standpoint, the 4C came in handy, allowing me an additional degree of freedom that i would have otherwise lacked. The ability to shoot where I looked, though, was problematic: When my character pulled his gun, the “gaze to shoot” option changed my perspective suddenly—I could be facing one way, but then my perspective could instantly rotate 45 degrees or so. And it wasn’t perfectly accurate, either. It all felt very artificial, and I still preferred my trusty mouse. 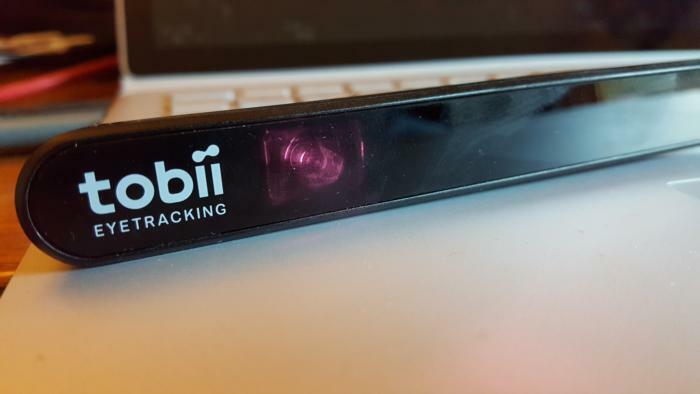 Ideally, the Tobii eye trackers would be sold with support for actual, real-live look-to-shoot: You look at an enemy, you click, bang. Sure it would be completely game-breaking, but really, why not? I’m still fascinated with the Tobii technology, even as I remain just as convinced that it’s just not quite ready for purchase. Something always seems to be just a bit off. 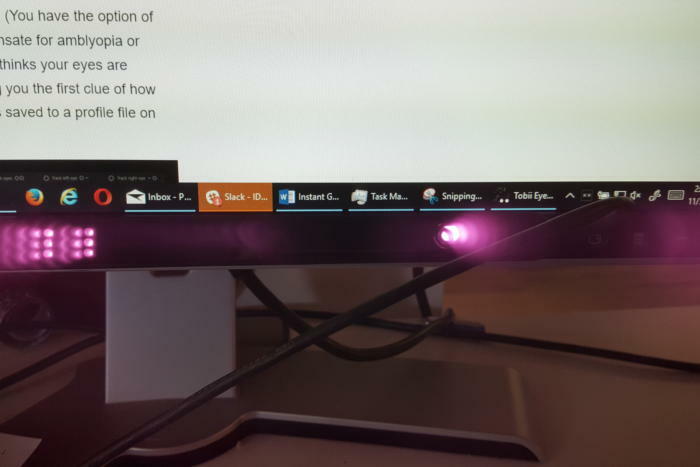 Eye tracking within Windows isn’t quite as precise and as smooth as I would like, and my mouse already “accelerates” when I whip it across the screen, offering a level of speed and accuracy competitive to what an eye tracker offers. There’s potential as a gaming peripheral, however, and for that reason I can’t write off Tobii quite yet.